c. Reposition the antenna in a different location, facing the direction of the broadcast towers is usually the best. Channels reception depends on what's being broadcast towers in your area, how far away you are from towers, and your surroundings. You'd better try to put your tv indoor antenna on the higher location, like on the wall, better close to or on the window, and no obstacles between your home to Broadcast Towers. And turn around the antenna leaf to find the best reception direction, sometimes a few feet can make a big difference. Step 1: Place the HDTV antenna in an area with good reception. Step 2: Connect the antenna directly to HDTVs with HD tuners or through a set-top box for TVs without HD tuners. [Without any fees & Free Channel] Never pay monthly cable bills again! HDTV Antenna can pull in all of your local news, weather,shows, cartoon and sports programs absolutely FREE. [Innovative Design: Paper-thin compact leaf design with stickable placement options. Slim, soft and lightweight so you can hide it behind the TV, lay it flat on the table or stick it high on a window. [Super Easy to Set Up] Just plug,scan and play！No tools needed. Place the antenna in different locations preferably on the wall or window to find the optimal location to pick up signals. Rescan the channels whenever the antenna is moved. 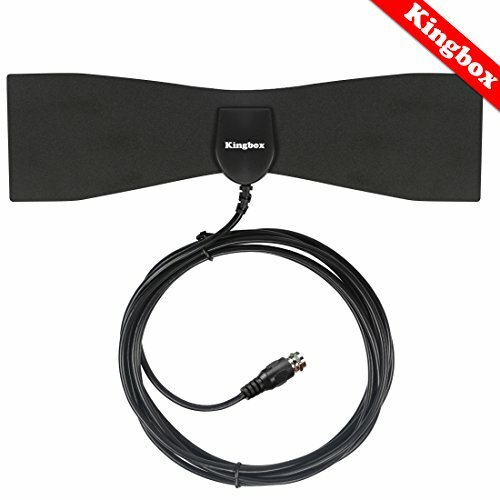 [WHAT YOU GET]: -Kingbox antenna try best to make 100%satisfaction of customers:1.response within 10 hours 2.high quality material 3.accept advices for the goods .4. 1 year warranty.Best quality to ensure customers have a awesome experience when they are shopping. If you have any questions about this product by kingbox, contact us by completing and submitting the form below. If you are looking for a specif part number, please include it with your message.